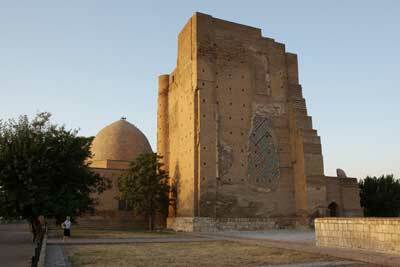 Several monumental buildings were built in Shakhrisabz in the time of the Temurids. The most magnificent of them is Ak-Saray Palace. Its fantastic ruins can be seen from afar and make a deep impression. 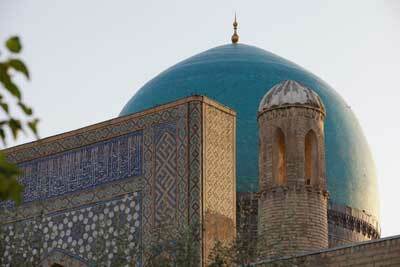 Amir Temur meant to make Shakhrisabz the second capital of his empire, no less sumptuous than Samarkand. The construction of the palace was started in 1380 and lasted more than 25 years. Dorus Saodat memorial complex. Jahangir's mausoleum. Alongside with the construction of Ak-Saray palace, in 1380 they started building one more monumental construction – Dorus Saodat complex. Of this complex there survived to our days only two constructions: Jahangir's mausoleum and crypt for Temur, where he was never buried. A dismal event motivated Temur to start building the memorial complex. To the south-west of Dorus-Saodat ensemble, upon elevated part of Shakhrisabz, which was the nucleus of urban area of ancient Kesh, there stands the architectural complex of Dorut-Tillavat. It started to develop beyond the ancient Barlas clan's mazar, where Temur's father – Emir Taraghay was buried after his death in 1361. 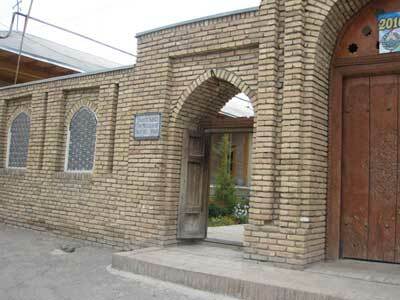 In 1435 in Dorut-Tillavat that stands opposite Shamsiddin Kulol Mausoleum there was constructed Kok-Gumbaz Mosque – the biggest cathedral Friday mosque in Shakhrisabz. 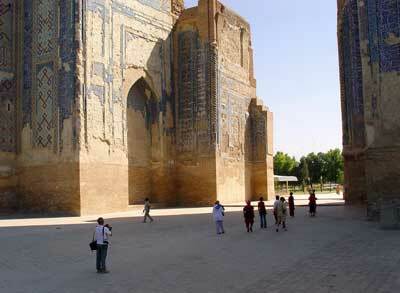 The inscription on the portal announces that themosque was constructed by Ulugbek on behalf of his father Shakhruh. Next to the memorial complex of Dorus-Saodat there stands one more monumental construction of the Temurids' time – Khazrat-Imam Mausoleum. Imam Muhammad Ben Khusein Sheybani nicknamed Khazrat (Saint) Imam Baghdadi lived in Iraq in the 13th – beginning of the 14th century and after death he was buried in the city of Ray. In 1384 Amir Temur seized the city without meeting any resistance on the part of its residents and most likely he took the mortal remains of the imam to Shakhrisabz, though this fact has not been testified by historical documents so far. 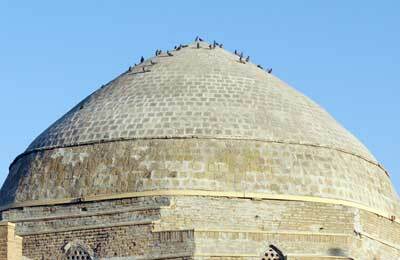 Two years later after the construction of the Kok-Gumbaz Mosque had been accomplished, Ulugbek ordered to construct a burial-vault, subsequently known under the name of Gumbazi-Seyeedon Mausoleum – 'Dome of the Seyeeds', right against the southern wall of Shamsiddin Kulol Mausoleum. Thus the Dorut-Tillavat architectural ensemble was completed. 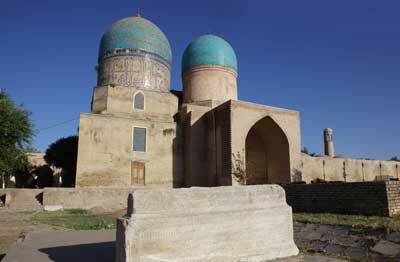 Shakhrisabz is one of the ancient cities on the Great Silk Road. It is located on the crossroad of brisk caravan routes leading to Samarkand, Tashkent and the Ferghana Valley, and via Termez to Iran and Asia Minor. 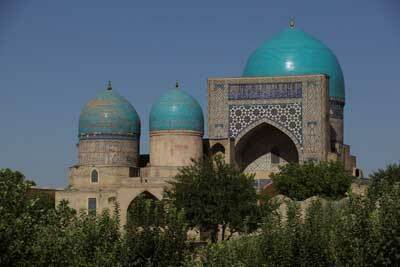 However, Shakhrisabz was not only a staging post for the merchants bringing their goods.